Initially known for her work in photography--which she has been making over the last three decades--New York-based artist Moyra Davey (born 1958) is also an esteemed writer, editor and, most recently, filmmaker, whose works layer personal narratives with explorations of other authors, filmmakers and artists. This book is based on two related projects that take form as text, photography and film. 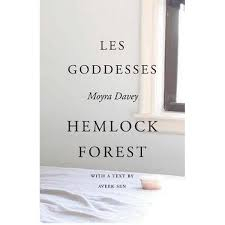 Les Goddesses (2011) collapses the lives of Davey and her five sisters with those of the daughters of Mary Wollstonecraft, the 18th-century feminist writer and activist. Hemlock Forest (2016) weaves references to Wollstonecraft, Chantal Akerman and Karl Ove Knausgaard with her own family stories. During the making of Hemlock Forest, Akerman took her own life. Her death soon engulfed Davey's awareness, prompting a broader exploration of Akerman's and her own biographies, amid more universal themes of compulsion, artistic production, life and its passing.